The Incas of ancient Peru possessed no writing. Instead, they developed a unique system expressed on spatial arrays of colored knotted cords called quipus to record and transmit information throughout their vast empire. The present book is based on a firsthand study of actual quipus that survived the destruction of the Inca civilization. 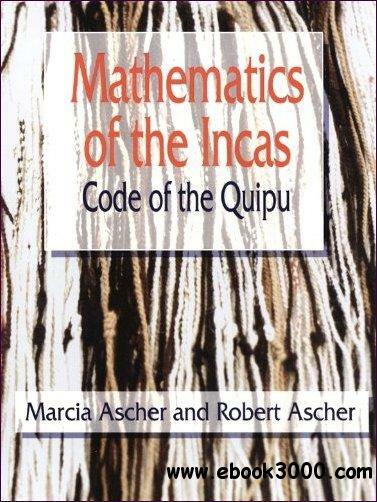 Written by a mathematician and an anthropologist, this book acquaints the reader with the cultural context of the quipus, the problem of interpreting artifacts from another culture, and the place of the quipu-maker in Inca culture. Although no previous mathematical knowledge is assumed, the reader is introduced to the mathematical ideas embedded in the quipus and learns how to make a quipu. Enhanced with over 125 illustrations, this unusual and thought-provoking study will interest mathematicians, historians, anthropologists, archeologists, and students of folk art with its unique perspective on the way in which pieces of colored string serve to embody a rich, logical, numerical tradition and are, ultimately, a metaphor for the civilization that created them. Preface. Exercises and answers within chapters.